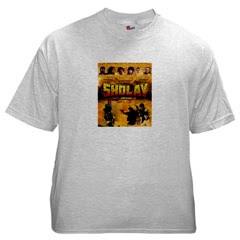 Everybody knows Sholay. 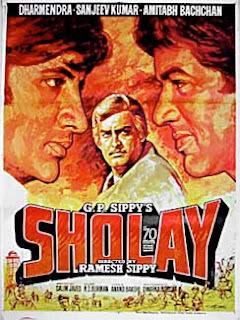 Released on August 15, 1975, Ramesh Sippy's Sholay remains an iconic and celebrated Hindi movie. "It's a part of India's heritage," says Hindi film director Dharmesh Dharshan. 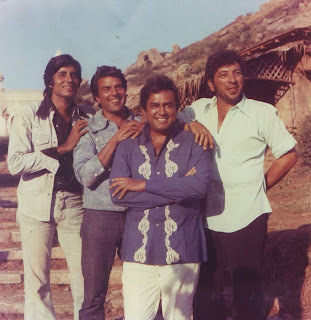 From left: Amitabh Bachchan, Dharmendra, Sanjeev Kumar and Amjad Khan pose between shots. 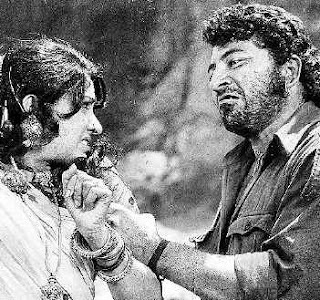 As legend goes, after listening to the script, Amitabh wanted to play Gabbar Singh and Dharmendra wanted Sanjeev's role; writers Salim-Javed had a hard time convincing them to play their assigned parts. Dharmendra denied any such desire on his part in a 2010 NDTV interview. For the first time, the music company Polydor sold dialogue audio cassettes of a movie in millions as the film gained cult status. Gabbar's dialogues are now part of Indian culture. Gabbar's pronouncements can be heard in jokes, weddings and social gatherings. Ad makers have wrung the Sholay lemon dry, yet the references keep coming. Children to elderly people will oblige you with their renditions. 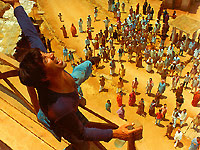 Satire, books, headlines, daily talk, all have allusions to Sholay's dialogues. 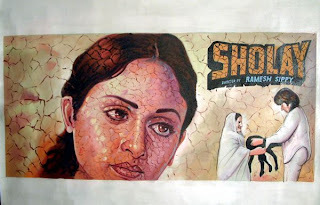 A hand painted poster of the film. Hand painted posters have long been replaced by glossy computer made images since. 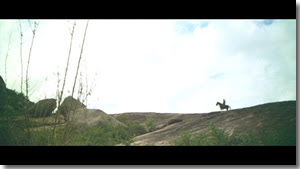 Gabbar looms at a distance, a shot inspired from Sergio Leone's Clint Eastwood westerns of the 1960's. 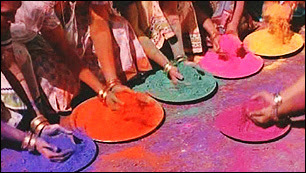 thunders Gabbar as he plans to catch the frolicking Ramgadhians unaware on Holi - the festival of colours. 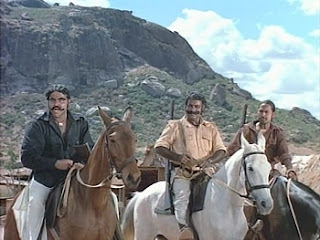 Viju Khote (left) in his famous brief role as Kaalia. 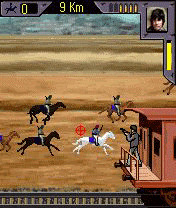 Nafrati, the horse he was riding was very temperamental. Kote was relieved when Kaalia is finally shot dead by Gabbar. Veeru's inebriated suicide threat scene is the last of the comic scenes in the film, before guns start sounding all around. Amjad and Hema did this scene over several retakes, until Hema's arm was sore with bruises. 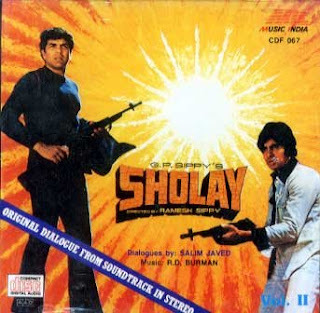 In the original Sholay, Thakur Baldev Singh(Sanjeev Kumar) uses his nail-sole shoes to cut off Gabbar's hands. Two equals, they fight until Gabbar is killed, trampled like a snake under Thakur's feet. Thakur breaks down with the sudden loss of purpose in his life and from relief. 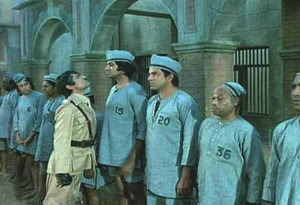 The censors did not want this "anti- establishment" ending during the time of emergency and stalled the film's release. Ramesh Sippy had to re-shoot an alternate ending with the police arriving from nowhere, which we see today. 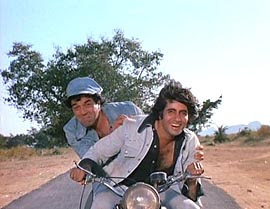 The first ending exists in rare bootleg video cassettes and CD's and those who have seen it say, Sholay was better as it was first shot.